Gosh! Where’s the time gone?! I’ve had a whole month to rustle something up to fulfil my pledge for the Made Up Initiative which is raising money for the National Literacy Trust. My mum bought this elephant and indian crepe, slightly sheer with a tiny amount of stretch for me a few months ago. I’ve been umming and arrhing for ages what to make with it so thought if I pledge to make something up with it I’d have a deadline and would do it. And I did! And I love it! I had a few suggestions on my Sunday Sevens when I was first gifted this fabric. 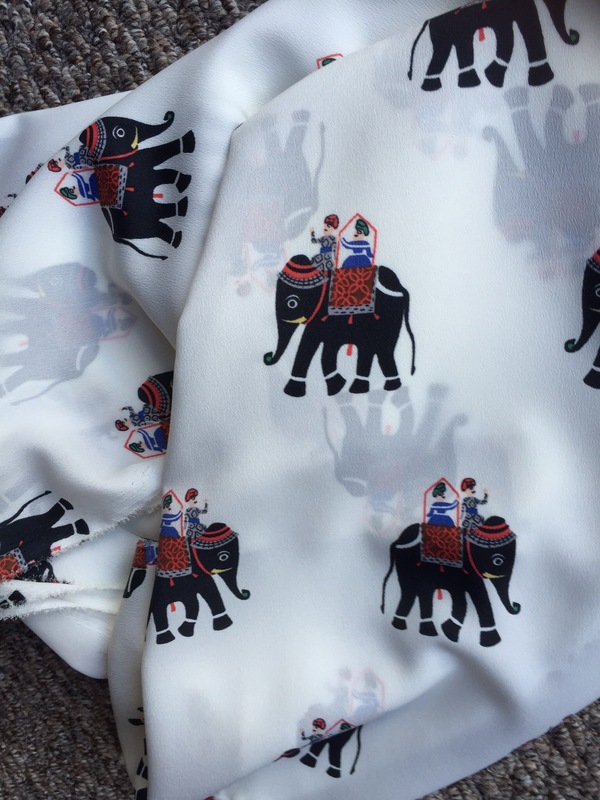 Sheila from Sewchet thought maybe a baby doll set for the boudoir, but Indians being ridden by elephants…… not sure if that’s an image I’d like to portray in the bedroom! I decided to make the Dimpsy T from Laura After Midnight. I’d made a hack of this before in a jersey fabric without the collar but thought it was time to stand up to my fear of making 2 identical Peter Pan collars and forge ahead! Click on the photo to be taken to Laura’s shop to see her patterns. This post might end up a bit long winded and picture heavy so I’ll cut straight to the finished garment and talk about the construction later (for those who are still with me!). Most of us either need a willing blog manager or a gadget to take photos of us wearing the clothes we’ve made. Or really long arms. I don’t have long arms so today I thought I’d give my Apple watch a try. Oops – photo of me looking like I’m telling the time (see feature photo at the top)! Then I realised I could use the 3 second timer, but forgot to smile! 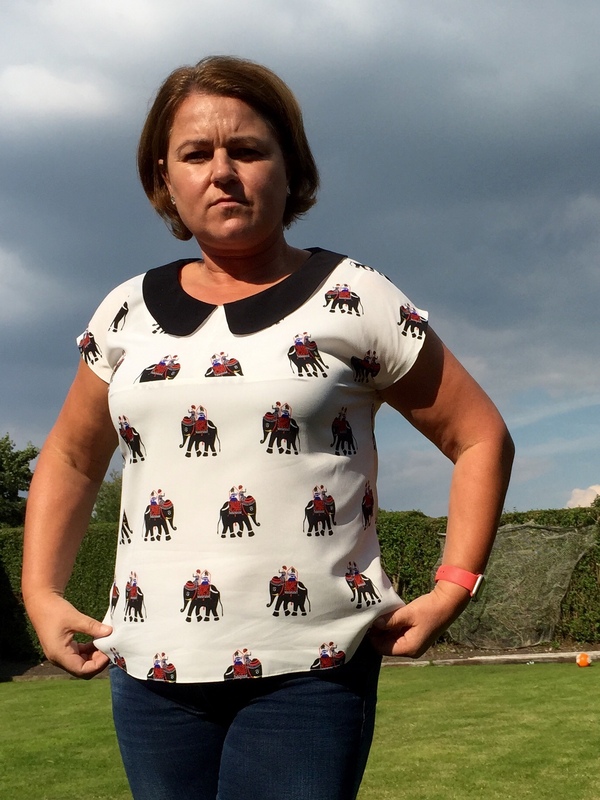 Here’s the back……… I remembered to smile for this one… honest! What do you think of the pattern matching? I had a bit of a nightmare as I lost the first back piece I cut out. Probably a good thing as I’d cut it on the fold not realising it had a centre back seam. 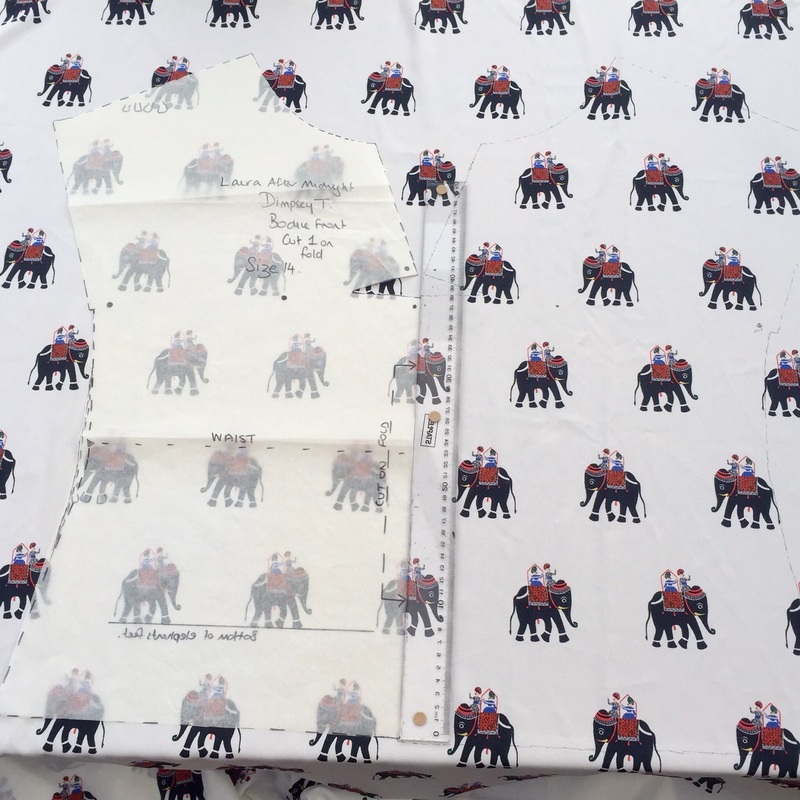 I was then struggling with the remaining fabric to get some sort of matching and ended up having to move the elephants up one row on one side which meant the elephants weren’t walking in the same direction. But it also meant I have 2 elephants back legs together. Twice. Looks a bit like the elephants have their legs crossed because they need a wee. Or is that just my vivid imagination!? And one last one with the watch firing off the camera on my iPhone – I couldn’t take too many as the builder on next door’s roof might thing I’m a bit crazy! I’m really pleased with it. I wore it out for tea last night, washed it overnight and have worn it again today. I’d say that’s a success! My friend came round for lunch today. She’s a bit choosy what she wears and she likes it so an added bonus! The construction was really straight forward. The pattern comes with a booklet of instructions. It didn’t say which side of the collar to add the interfacing. I had a feel of my husbands shirts and added mine to the upper part of the collar. I also added interfacing to the inner facings but it didn’t say to. The front piece has a unique dart that I’ve not seen elsewhere. 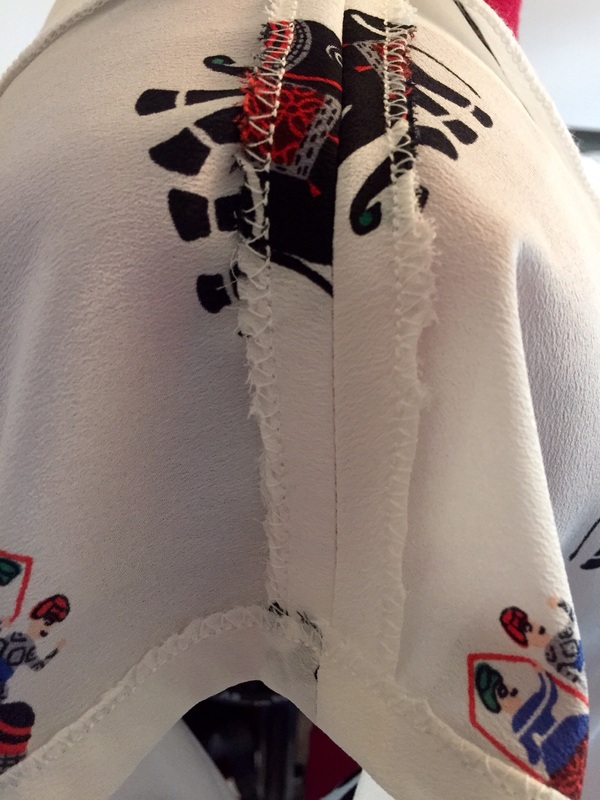 It’s really simple to sew but created a bit of a headache when it came to pattern placement. 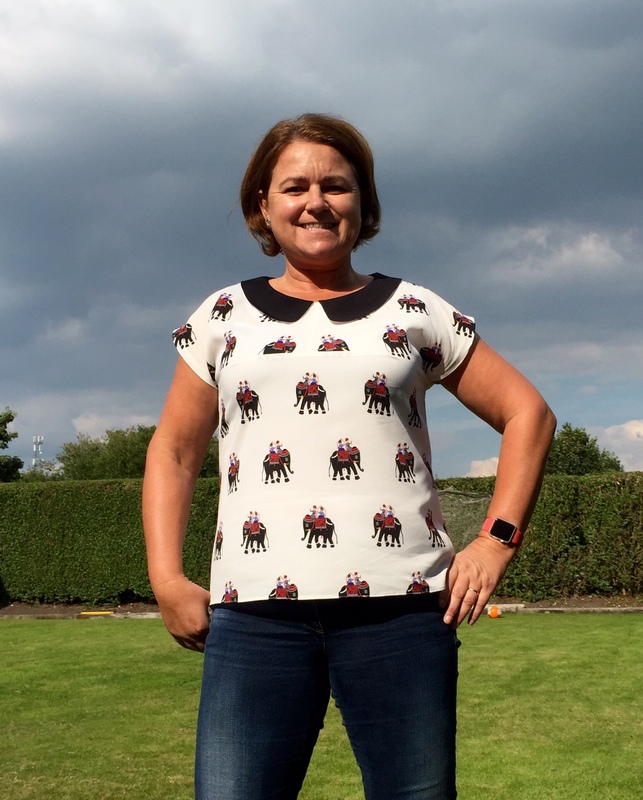 I opted to have the centre seam elephant free! 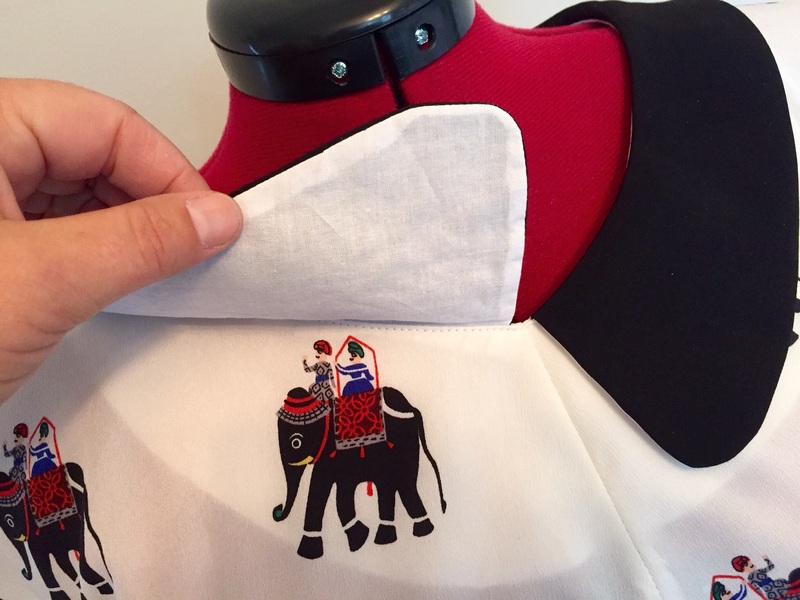 For the underneath of the collar and the inside facings I used white cotton lawn otherwise the elephants would show through if I’d have used the fashion fabric. I used my frixion pen to draw around the pattern, then cut it out. 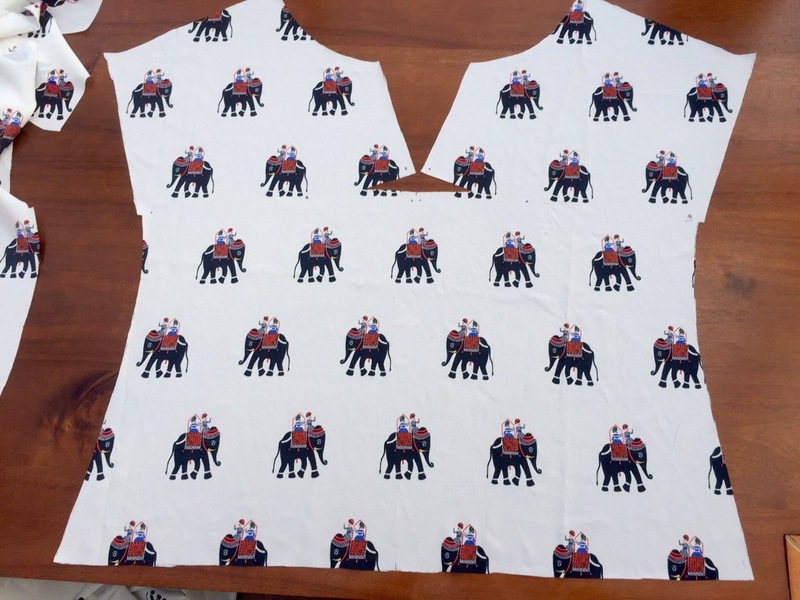 I used this method when cutting out the main fabric too. 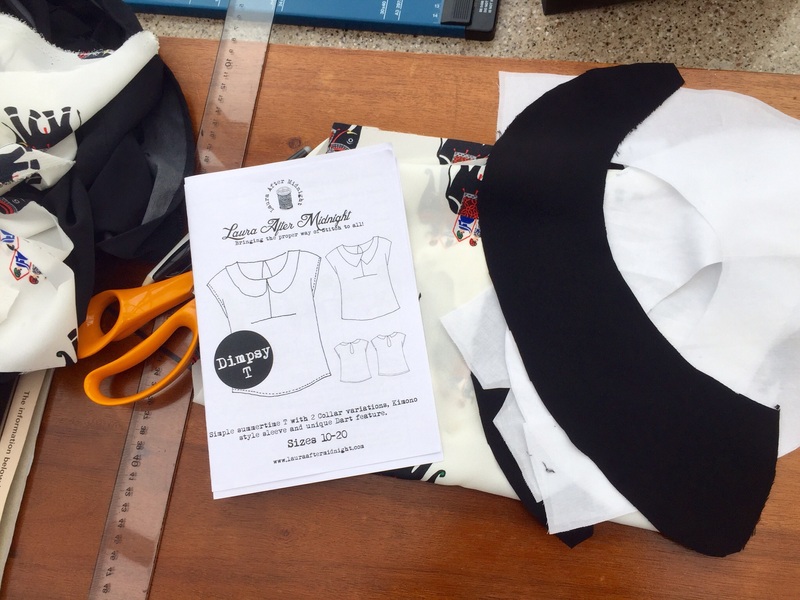 The black fabric for the upper collar was chopped out of an old black top in 100% viscose. It was ever so slightly heavier in weight than the elephant fabric, and a bit tricky to work with. Once I’d sewn both collar pieces together though the cotton lawn kept everything in check and it was fairly easy to sew. I was a bit dubious about the back opening and thought it might not sit properly as it had a centre back seam on the facing and the back of the garment. Not that I’m an expert in these type of openings, I’ve only done it once before and that was in the Sewing with Silk class that I attended. 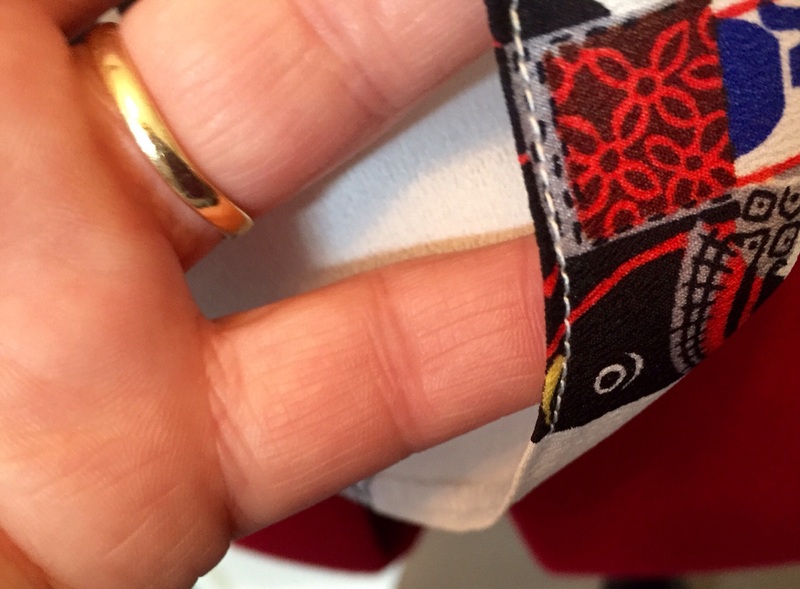 I needn’t have worried – it worked, and I’ll happily use that method again, unless theres any pattern matching to do, in which case I’ll opt to cut it out on the fold. 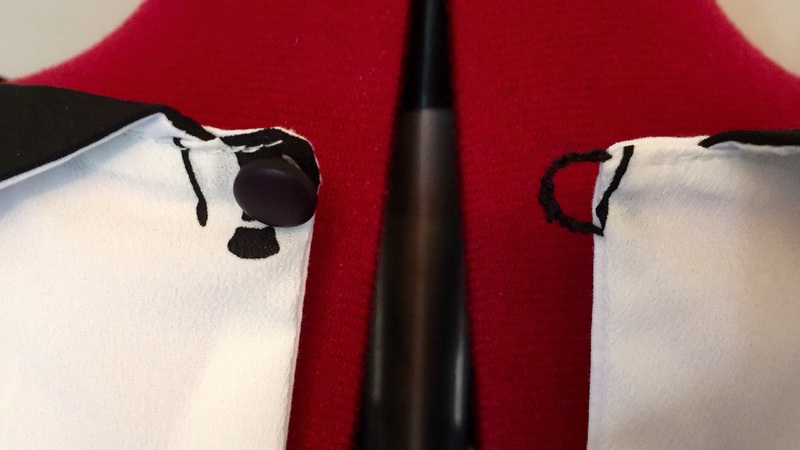 I had this tiny black button in my stash…. perfect! And here is only the 2nd loop fastening I’ve stitched, I think I’ve got the hang of it now. The first one was on my silk top and I made it too big which caused the button to keep coming undone. This shows the usual bust dart. I’m thinking for my next Dimpsy T I might do a narrow lace insertion in the centre seam. I used a couple of different finishes on the raw edges. Firstly I used one of my sewing machine’s overlock functions as I was too lazy to change the thread on my overlocker. Everything I’ve sewn in the last 3 months has been overlocked in bight red but I didn’t think I’d get away with it on this sheerish fabric. For the side seams I used a narrow zig zag but it bunched up my fabric, so in desperation I changed the thread on my overlocker. It really only took 2 or 3 minutes and I wish I’d have done it sooner! I forgot when I made my last Dimpsy that I had to add a lace trim otherwise it would have been too short (for my liking). For the hem I decided to overlock the raw edge, then turn and stitch for a really narrow hem. It turned out really well. 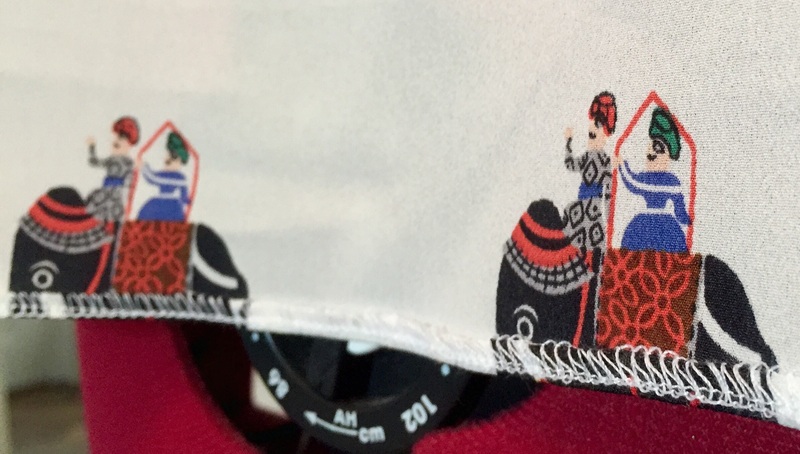 I didn’t use any special feet on my sewing machine, and pressed after not before stitching. 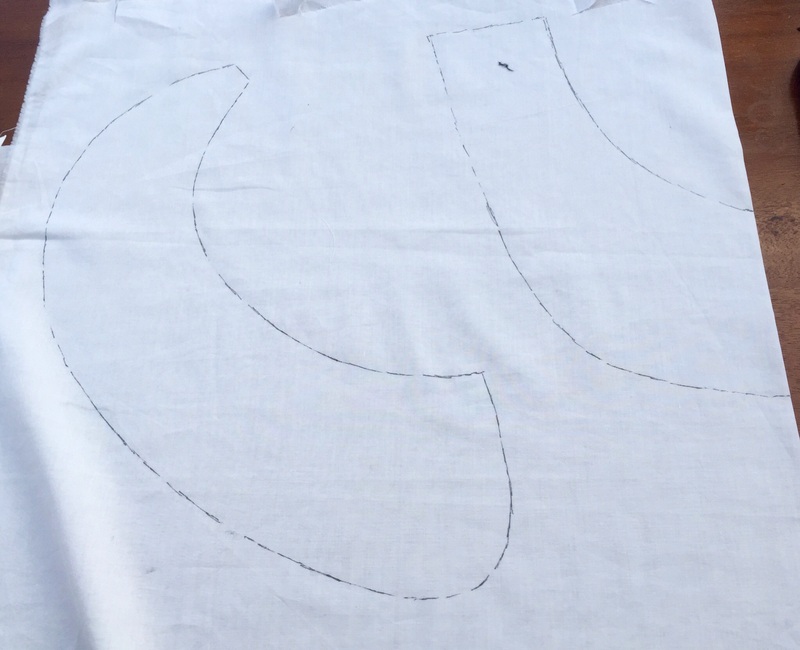 This photo might help those of you who are new to cutting out patterned fabric – I cut it out in a single layer rather than folded. 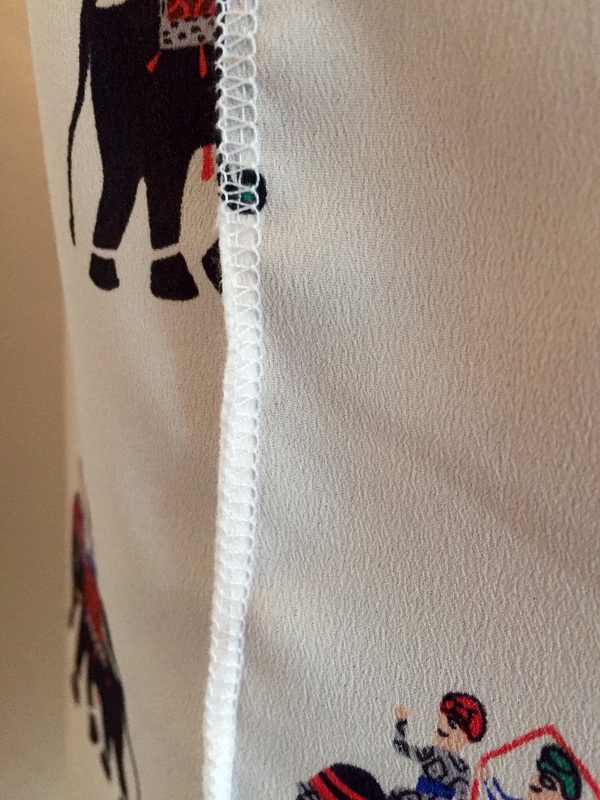 The ruler was kept in place to show the centre and I drew on the pattern piece a line for the bottom of the elephant so I could align it easier. This next photo shows the markings I made with my frixion pen. They’re ace! So long as you don’t iron your fabric before you need the markings!! I’d actually cut this pattern out initially in a smaller size so just added aprox 1/2 inch to the sides. 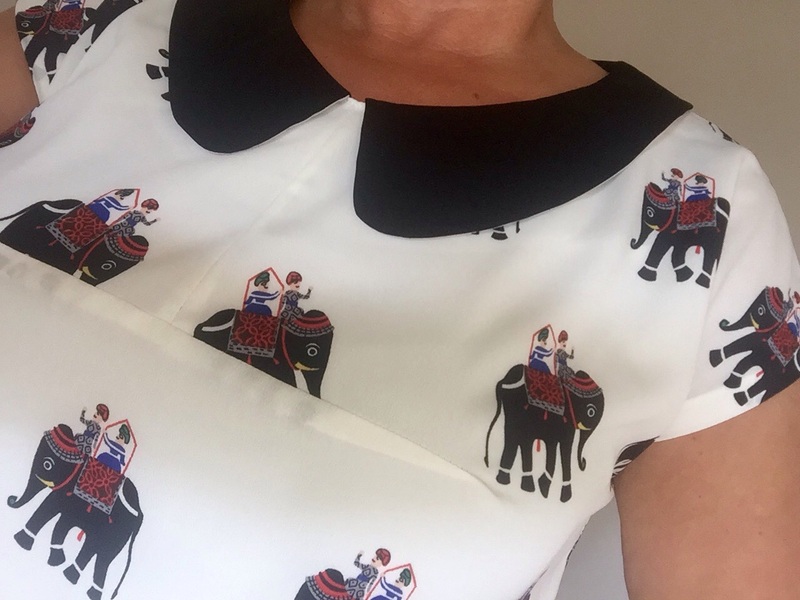 I just eyeballed it and got lucky – it fits! So that’s my contributions to an amazing cause. I just wish I could attend the meet up tomorrow. Is it too late to book a train?! It’s only 2 1/2 hours on the fast one! To those who are going, hope you have a fab time, and well done to Karen for thinking up such a great fundraising idea, and to all those who’ve supported it! Fantastic make! I love it! It looks so neat and well made. I can see that top going with a lot of things. Your mum has excellent taste😃. You know the Kama Sutra originates from India so it might be perfectly appropriate for boudoir😂. And I totally thought you were posing telling the time in the first shot. Great pics btw. I like this top a lot! The fabric is just great and the patternmatching on the centre back is just inspired. 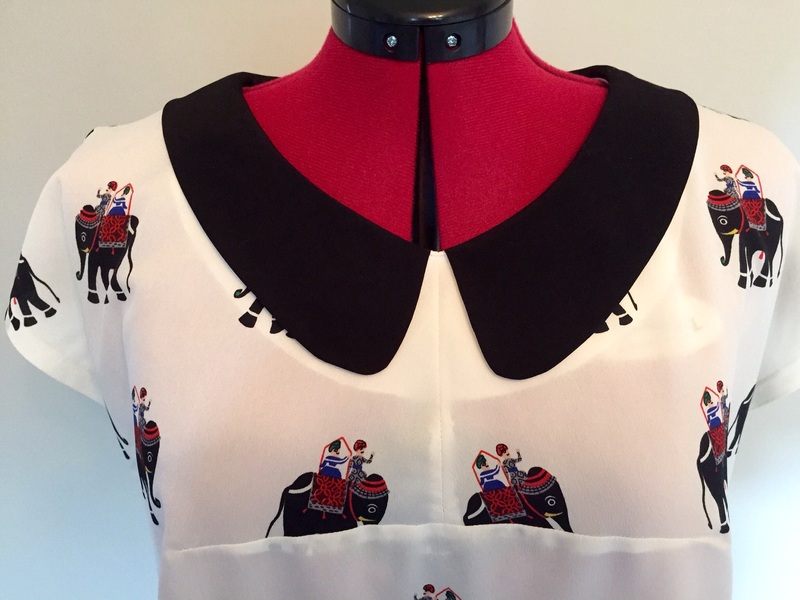 And the Peter Pan collar really suits you! 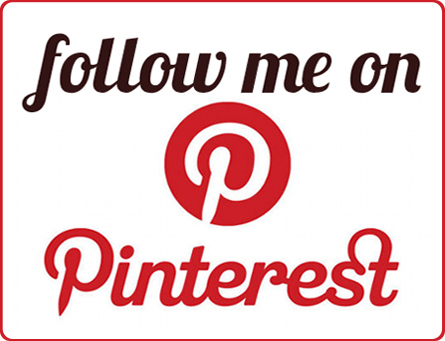 It’s fabulous…..and I love your post. You really make me laugh. First thought about first photo: Oh, I LOVE IT ! ! ! I love your fabric. 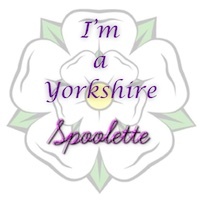 I didn’t think they had to wee until you put the thought in my head! Very clever use of the pen to make your adjustments! Lovely job! Cute top. I have really long arms and it doesn’t help any with the selfies. Really lovely, this one. That’s another pattern to add to my wish list!!!!! Love the elephants. Love the pattern matching! Great job – the collar looks fantastic. I think those first two photographs are the first I’ve ever seen of you without your huge grin! This top is super! 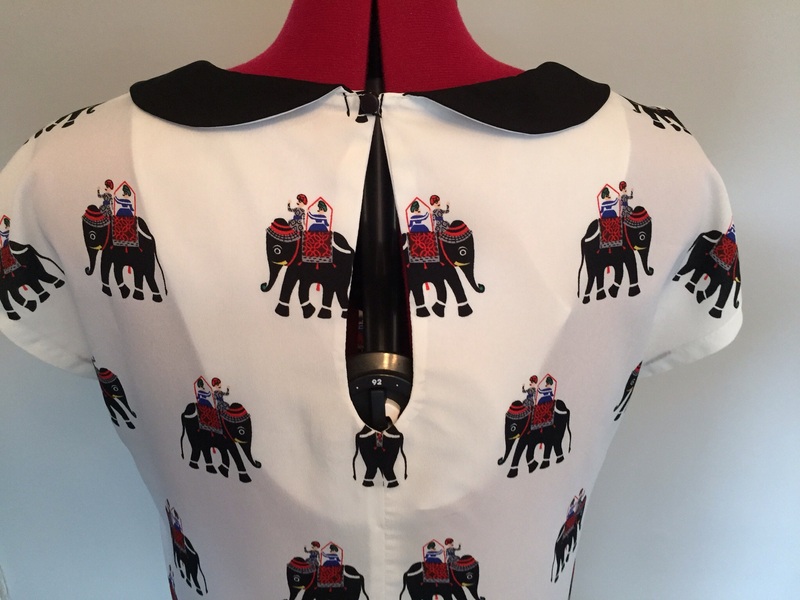 I couldn’t figure out the neckline, didn’t realize it was this pattern – which I really liked the first time you posted. 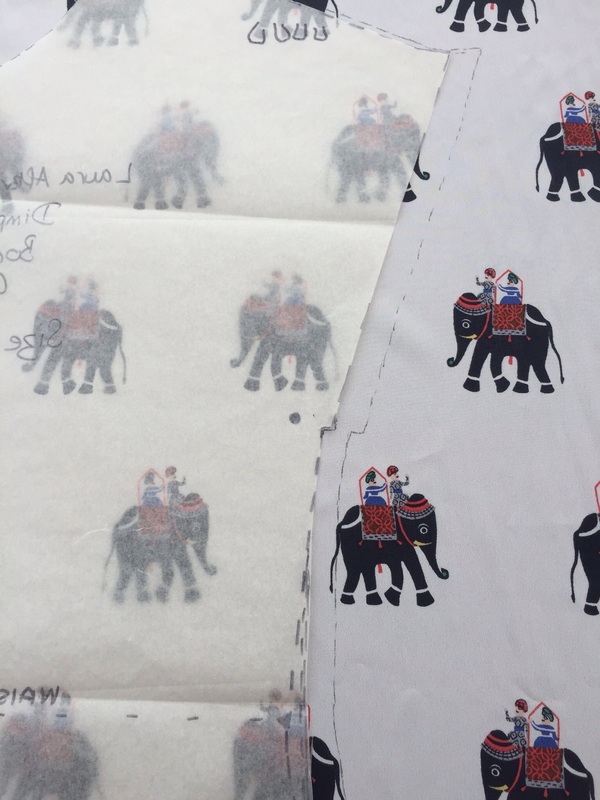 And the elephants making the wee line down the back is so funny! 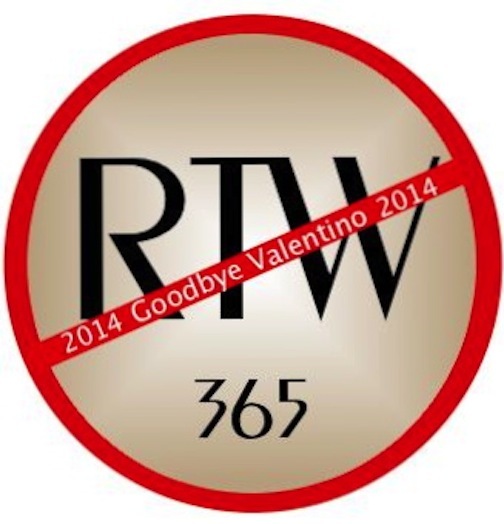 Great job, fabulous submission for a very worthy cause. Good luck! 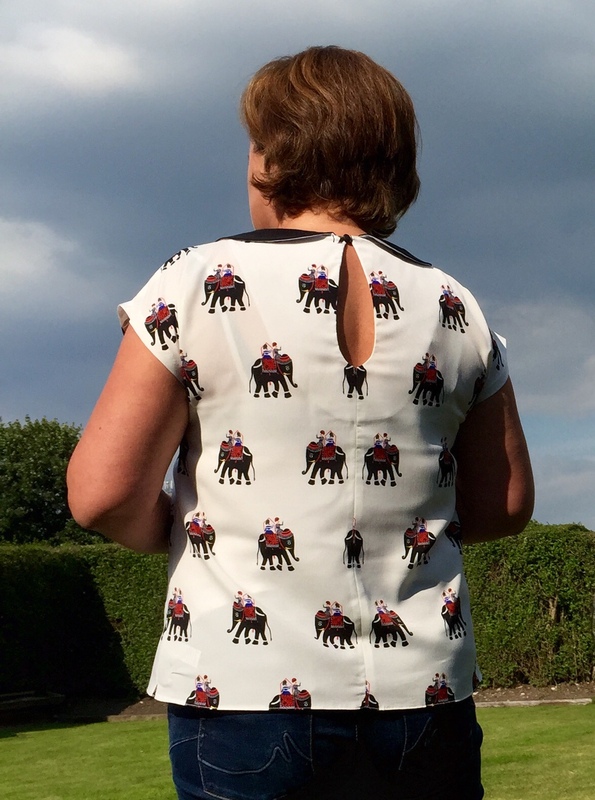 I love the elephants – its such an unusual print and cutting it out flat worked out really well – even the disappearing ones look good (and perfectly matched!). The front dart is really flattering – I haven’t seen darts like that much before.